DeVos steers his own Swan 47 and was a member of the spectator fleet at the J Class Regatta in Narragansett Bay, Rhode Island. 'Unfortunately, Saturday morning was foggy and we lost sight of the boats until Ranger came out of the fog flying a huge spinnaker a couple hundred yards astern of us. What a beautiful sight,' DeVos said. That was the feeling among many of the spectators as the J Class Association ran the first of the J Class Regatta series that will culminate in Newport in 2014 when eight or more J Class yachts are expected. The Newport event was really a match-race series as Hanuman, another J Class yacht, stayed on the hard in Newport Shipyard, leaving Velsheda and* Ranger* to battle it out. Of the other J Class yachts, Endeavour is in New Zealand undergoing a full refit to outfit her for racing and Shamrock V is cruising in the Mediterranean. 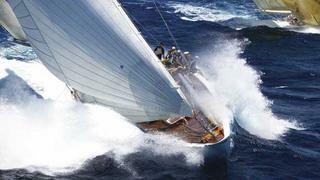 Seven new J Class yachts are under construction or about to be launched so any future regatta could be very exciting. Like most match-racing series it came down to the yacht that won the start won the race and Ranger managed to win four out of the five starts and four of the five races. Ranger was sailed by a professional crew with America’s Cup veteran Brad Butterworth calling the shots. Velsheda was steered by her owner. The J Class has a time allowance if the owner steers instead of a professional and Velsheda's times corrected out to within a second in one race and three seconds in race three. The Newport racing was quite varied with winds in the fifteen-knot range on the first and second days out of the north courtesy of a cold front that had gone through the previous night. Ranger won the start and led under the Newport Bridge to Gould Island, a mark of the course. Once around Gould the yachts went south with spinnakers flying and an outgoing tide. They dashed past Fort Adams and crowds of spectators, out past Castle Hill and out to the leeward mark where Ranger led by about five boat lengths. Velsheda closed to within two boat lengths on the two-mile reach, but Ranger pulled away again after rounding the turning mark. At the finish, Ranger led by 41 seconds, which corrected out to a one second lead. The second day’s racing was similar with Ranger taking a leeward position on Velsheda’s bow at the start off Fort Adams. After both yachts tacked, Ranger was in the controlling weather position and made the most of it, covering Velsheda carefully as the giant yachts veered to windward. As they came onto a reach, Ranger led by several boat lengths, and again Velsheda closed, but Ranger hoisted her giant spinnaker and turned for home on a making tide. At the finish, Ranger led by 49 seconds which corrected out to a 27 second win. Friday’s racing was canceled with thunderstorms expected and two races were run on Saturday into a freshening southerly breeze. Both races were won by Ranger who forced Velsheda to circle outside the committee boat at the start of race four. This was Ranger’s most crushing victory as she crossed the line two minutes ahead. On Sunday in a very light northerly, Velsheda got her revenge and won the start to lead Ranger around the course. The first official J Class Regatta since the 1930s (other J Class races have been sailed in Newport as fundraisers) could be considered to be a success even though only two yachts participated. Spectators were awed by the spectacle and most watchers are looking forward to seeing more J Class yachts sail in the bay and around the world.